Widen KY 20 (Petersburg Road) from two to four or five lanes from Graves Road to KY 237 (North Bend Road). Construct a multi-use path along both sides of the roadway. Improvements to KY 20 (Petersburg Road) will provide sufficient capacity support the increase in traffic expected from future development and the proposed I-275 interchange with Graves Road. Improved KY 20 will provide a safe and efficient connection to the I-275 interchange with Graves Road. By providing an alternative connection, the travel demand on KY 237 near the existing I-275 interchange will be reduced. Widening KY 20 will improve the geometric conditions along the roadway and reduce the frequency and severity of crashes along the roadway. Installation of bicycle and pedestrian facilities along this section of roadway will provide a direct connection to the proposed multi-use path on KY 237 (North Bend Road). 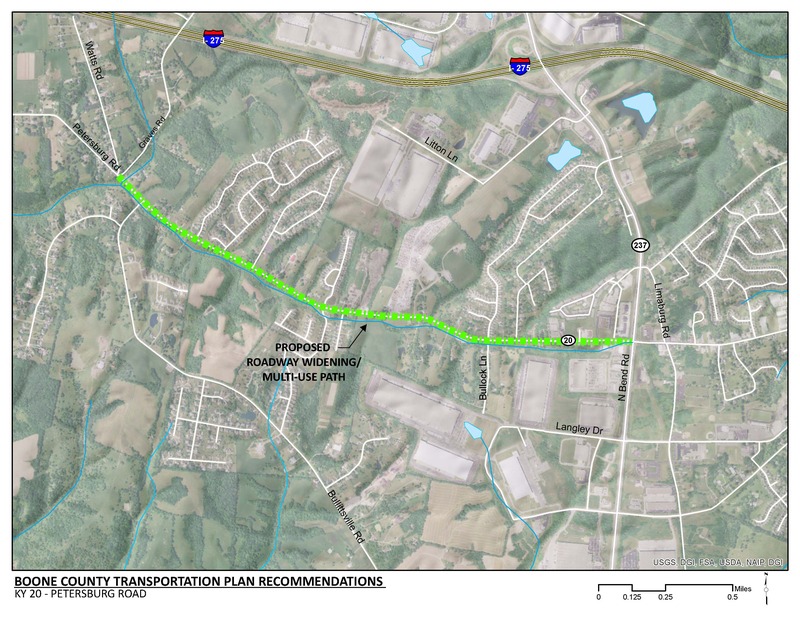 This project is consistent with Boone County’s overall goal of improved safety and connectivity for bicycles and pedestrians. Click HERE for a map of multi-use paths in Boone County. The project will need to avoid or mitigate potential historic sites in the area. Woolper Creek runs south of the existing roadway. Impacts to the stream will add costs to the project. Structures will be required to cross tributaries to the creek. The future interchange at Graves Road, in combination with planned residential and industrial development, is expected to increase the amount of traffic and the proportion of trucks that use this facility. Existing KY 20 is a two-lane roadway. Current through lanes are not expected to provide sufficient capacity to support the increased volume of traffic after construction of the Graves Road interchange and planned development. KY 237 in Hebron is congested near the existing I-275 interchange. KY 20 (Petersburg Road) connects Hebron and Petersburg. Existing land use served by this roadway is primarily agricultural and woodlands. Future 2040 land use maps indicate additional residential and industrial land use. Woolper Creek flows along the south of the roadway. The frequency of crashes along KY 20 in the project area is 37 percent higher than the statewide average for similar roadways. Public comments voiced the desire for dedicated bicycle and pedestrian facilities along this corridor.